NEW YORK (AP) — D'Angelo Russell credits Brooklyn coach Kenny Atkinson for giving him an extra push this season. Markkanen scored five straight points late in the fourth to inch the Bulls closer 110-106 with 2:18 left. On the next possession, Parker blocked DeMarre Carroll's driving layup and Russell was able to recover the ball near the halfcourt area after a Chicago defender tried to scoop it up. Russell's hustle play was capped with a nifty pass to a cutting Harris that made it 112-106. Bulls: Markkanen is the first NBA player to notch 19 rebounds without tallying an offensive board. DeMarcus Cousins was the last to do so when he pulled down 20 rebounds in 2015. 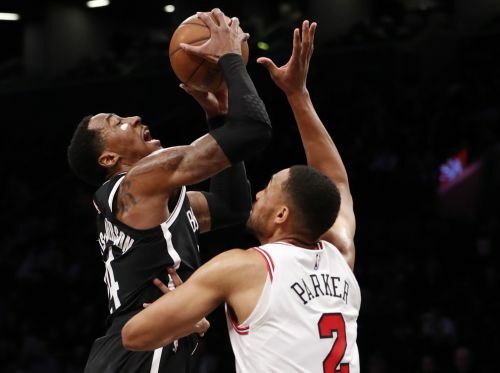 Nets: Napier's five 3-pointers matched a career-high. ... Brooklyn's nine-game winning streak at home is the second-longest active winning streak in the league. Toronto has won its last 10 at home. Russell recorded his league-leading third game this season with at least 30 points, five or more assists and no turnovers. Paul George is up next with two. Brooklyn rookie F Rodions Kurucs was selected to the Rising Stars game, which will be held Feb. 15, two nights before the All-Star Game in Charlotte. The Latvian will be play for the World team. He has been a pleasant surprise for the up-and-coming Nets this season. The 20-year-old is the lowest drafted player chosen to this year's game between the top first- and second-year players. Kurucs entered the night averaging 9.4 points off 49.4 percent shooting from the field in 34 games. He will be joined by starting center Jarrett Allen, Brooklyn's first-round pick in the 2017 draft. Allen, who will be on the U.S. squad, is averaging 11.3 points, 8.3 rebounds and 1.5 blocks in 49 games this season. Markkanen will represent the Bulls. He has posted 17.1 points and 7.4 rebounds in 27 games after missing the first 18 to start his second season in the league due to a sprained right elbow. Bulls: Continue a three-game trip Wednesday night in Miami. Nets: Play at San Antonio on Wednesday night.